And now I get to give away a copy of this DVD to one of you! All you have to do is enter via the rafflecopter widget below. There is always a mandatory entry, so be sure to do that first, then enter using any other optional entries that you would like to as well! Thanks for taking time out of your day to stop by and enter. I appreciate you! I don't remember it but this movie looks so good. I like that this is a true story and an intense movie. I remember it well. I was living in the suburbs of Atlanta then. For those couple of days... people were cautious going any where then. You just did not know where he was hiding. I have not read the book and i do not remember hearing about this at all. The movie looks great and i would love to see it. Yes. I have read TPDL. I attend a purpose driven church. And I do remember when the story was in the news. I have not read the book but I do vaguely remember hearing about his escape. I've never read The Purpose Drive Life but have heard of it. I don't recall the story on which the movie is based. No- but I have been meaning to read it when I have the time. I do remember watching this incident on the news. It was a pretty compelling story. I did not read The Purpose Driven Life and I do not remember hearing about when Brian Nichols escaped. I did not read the whole book.. But I do remember the captive incident because I saw it on the news.. 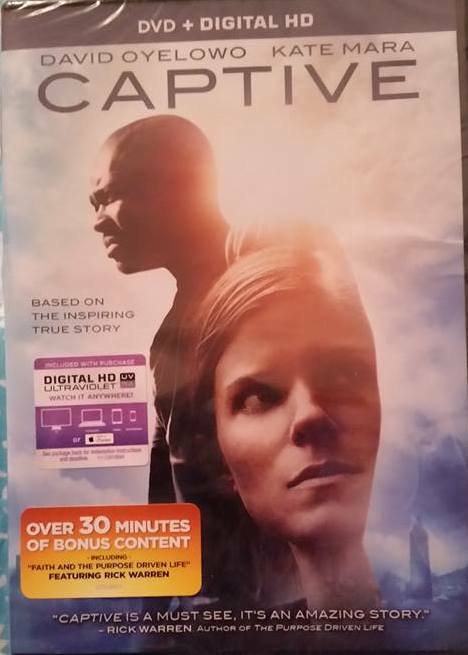 I recently read the Captive book and it was awesome! I had not heard of the events upon which the movie is based. I didn't. I'm not familiar with it.